Skip the fake cobwebs this year and add some haunt to your house with these spooky specimens. Pictured above (left to right): Japanese blood grass and black mondo grass; carnivorous plants including Cobra plants, Venus flytraps, and pitcher plants; ‘Sticks on Fire’ Euphorbia; Swiss cheese vine (Monsteraobliqua). With edges like shark teeth, dyckia threaten anyone who comes too close. Plant in black square containers with a top-dress of dark gravel for a sleek, modern look. Can you spot the little bat faces with red ears in the flowers? Bring a sprig of this perennial indoors to frighten your dinner guests. 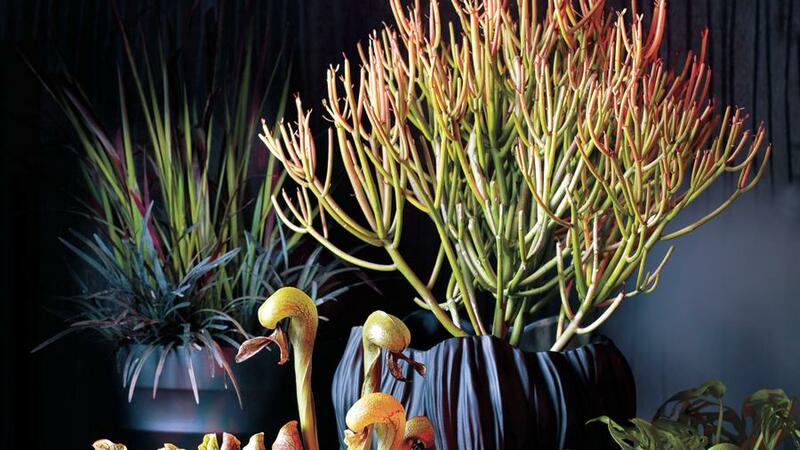 Place a bowl of these carnivorous plants on your windowsill and wait for them to snap closed on unsuspecting insects—or trick-or-treaters. These bold specimens resemble their namesake winged creatures of the night. With dark blossoms and strange whisker-like tendrils, a trio of Bat lilies (Tacca chantrieri) will make a statement as a Halloween table centerpiece. The wavy branches of a potted Pencil tree (Euphorbia tirucalli) look like a hand reaching up from the grave. Grow these South African plants in a sunny window and watch them arch towards the light. These strange-looking succulents (Pleiospilos sp.) evolved in arid, desert landscapes to look like speckled rocks. Place in a container of potting soil topped with black sand and they’ll look like the rotting flesh of a deadman’s fingers or tiny granite tombstones.